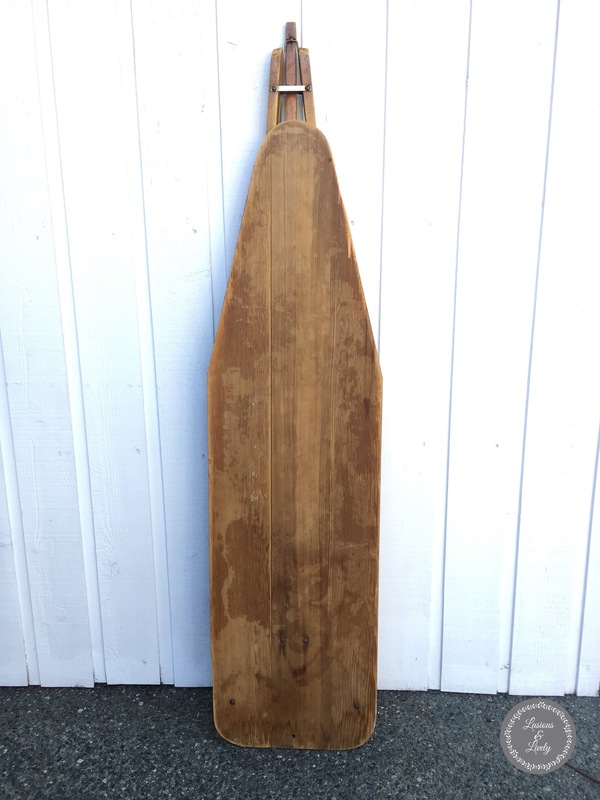 I have been trucking this ironing board around with me for years. 1. 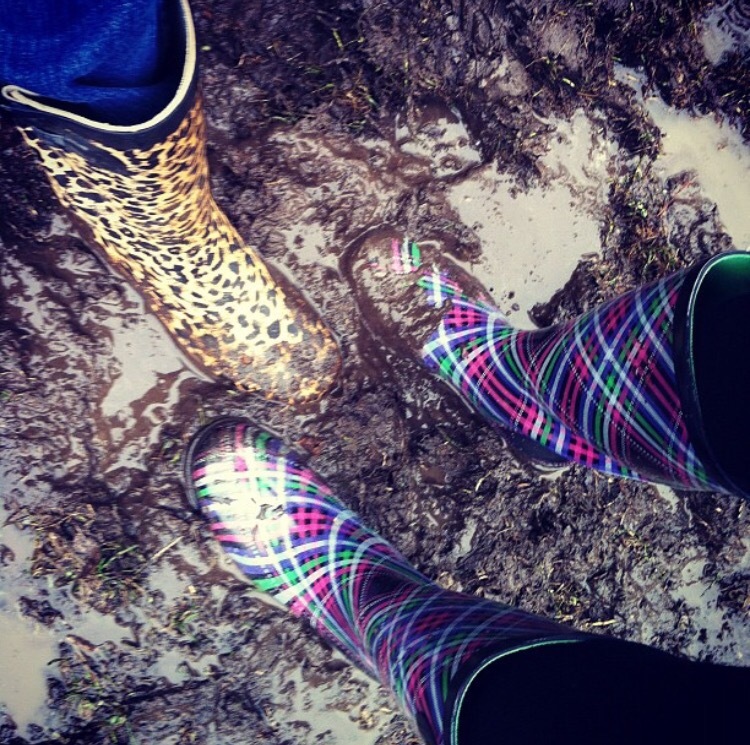 The muddiest auction ever, aka a good excuse to wear our rain boots. Also the auction where I dropped my mitten in a puddle, so I dried it on the barbecue. 2. The time our friend Amanda bought an organ for $1 because she felt bad that no one else wanted it. The organ bench had already been sold, so her organ was also benchless. This was the same auction where I got this ironing board. You win some, you lose some. 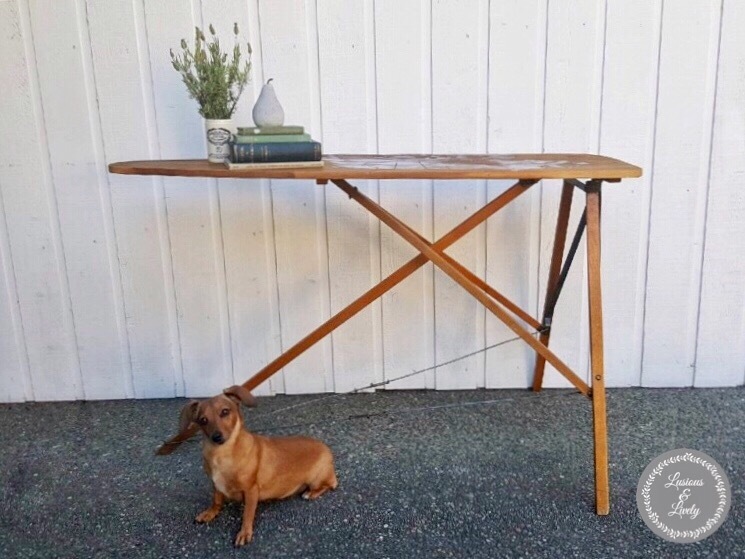 I knew I wanted to repurpose this into an entry table or a sofa table. But I never knew what *exactly* to do to make it unique. Until Canada’s 150th birthday this year! I love my country, and am proud to call it home. Sometimes it can be a little disappointing when so much of the DIY world has a million 4th of July projects on display, and we are up North trying to rework the DIY to fit our flag. So I decided to make this ironing board sing Canada’s praises. I slapped the map right on it. 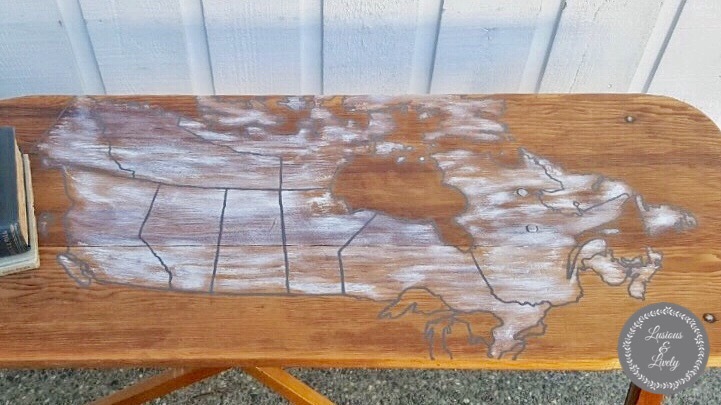 I carbon traced a map of Canada onto the board, and then hand painted the borders in Country Chic All In One Decor Paint in “Rocky Mountain” and dry brushed the inside with the same paint in “Simplicity”. I gotta say, Canada, you have a LOT of outer edges to paint. All those islands up in the NWT and Nunavut. 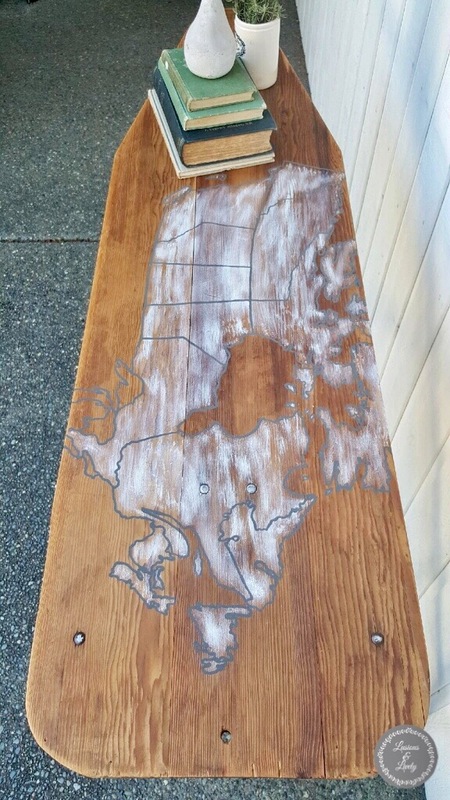 After hand painting the map, I gave the wood a much needed drink of Hemp Oil. And then I freaked out a little. This wood was SO thirsty, and it went SO dark. You couldn’t even see the lines I had so carefully painted. So I folded it up the next day and tucked it away, trying to decide what on earth would fix it. It turns out time was all it needed. As the Hemp Oil cured, it lightened up and my work regained its clarity. It was still darker than it was originally, but not the total loss I had once thought. PHEW! * A note for my American friends, the ones who have no idea what I meant when I said Nunavut…click here for some oddly named Canadian locations. Yes, I have been to Spuzzum! Or rather…driven straight through it.